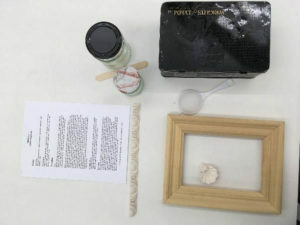 by Daniel Sanchez Villavicencio, PhD student in History of Art. 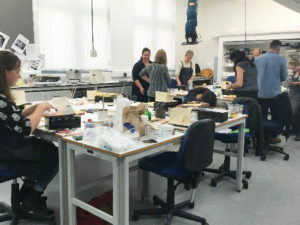 Taught by the head frames conservator of the Royal Museums Greenwich, Tim Ritson, and attended by a diverse group of 11 conservators and 2 students from Australia, Canada, England, France, Mexico, Northern Ireland, Norway, Scotland and Wales, the course aimed to familiarise the participants with the materials and techniques of the two traditional methods of gilding: water based, and oil based. 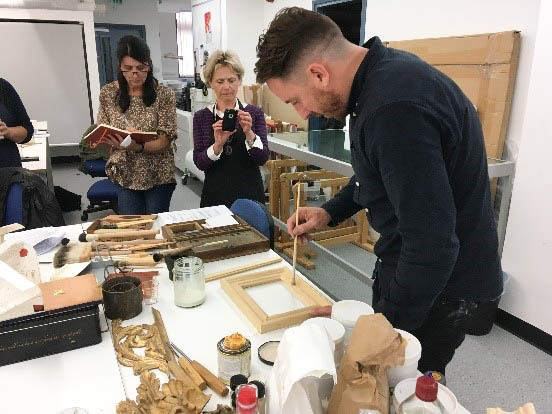 The course was impeccably set up, with a carefully prepared gilding box for each participant, containing a gilders cushion, a tiny squirrel’s hair gilders tip and fine brushes, a gilders knife and a square-shaped gold leaf book of 23 karat. 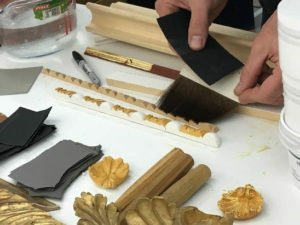 All of these would be used for gilding different objects, including a plaster shell, two different mouldings and the pièce de résistance, our very own wooden frame. 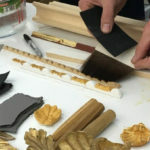 Each of them allowed the practicing of both gilding techniques, comparing their advantages and difficulties, whilst testing our manual skills and even the ability to maintain a calm breathing, as the delicate gold leaf seemed to vanish into dust with the slightest breeze. When I was a designer at the British Museum I had the interesting task of having the whole walls of the Oriental Gal. covered in gold leaf. I think we had 4 gilders working for quite a few weeks. I am glad more gilders are on the way! The effect was remarkable as the walls appeared to glow differently as the light changed.